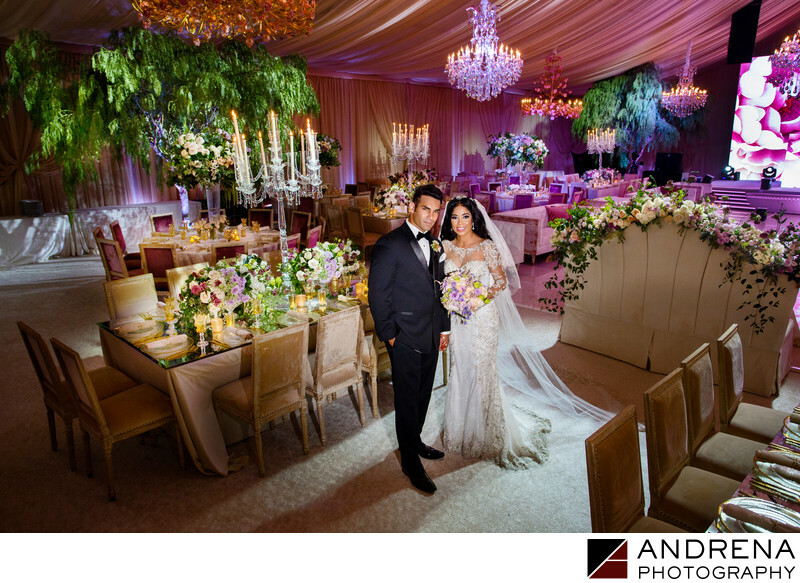 This stunning wedding was designed by the talented team at Aliana Events alongside Celio's Design. This custom-built tent was draped in champagne and filled with stunning florals in a soft palette of blush, rose, champagne and green. Chandeliers and rentals provided by Revelry Event Designers coupled with incredible performances by various dance troupes ensured that this wedding was enjoyed by all who attended. In recent years, it's been a major trend to photograph the wedding couple in the ballroom once their decor is finished but before the guests have been let into the reception area. Did I mention that horse-drawn carriages carried guests from street level to the custom-built ceremony site high atop a mountain at a private estate? Keywords: Aliana Events (12), Celio's Design (3), Los Angeles Weddings (3).